The goal, of course, is to maintain safe and healthy blood sugar levels—what doctors like to call “tight control.” Since diabetes is often symptomless, that makes monitoring your glucose levels essential. This chapter describes the tools you need to do just that. Knowing if your blood sugar is high, low, or just right will guide decisions about what and how much you should eat, whether you need medication, and how active you can be. For example, if a reading shows that your blood sugar is too low, you’ll know it’s time to munch on a carbohydrate-rich food (or pop a glucose pill, which you can store with your meter) to give your levels a boost. A high blood sugar reading signals that you need to bring glucose levels back down to normal. How you do that will depend on your personal diabetes treatment plan. Some medications, such as sulfonylureas, decrease glucose levels by increasing insulin production. Other medications, such as TZDs and metformin, decrease glucose levels by decreasing insulin resistance or decreasing liver glucose production. What’s more, keeping close tabs on your blood sugar levels can provide your physician with critical information that he or she can use to make decisions about what treatments will work best for you. Finally, knowing that you are maintaining healthy, safe blood sugar levels provides some reassurance that you will avoid the complications diabetes can cause. We’ll discuss those complications later in the book. Should you monitor your glucose? If you’re reading this book, then the answer is probably yes. Most experts agree that glucose monitoring is most important—make that essential, mandatory, no ifs, ands, or buts—for people with type 1 diabetes and anyone with diabetes who takes insulin or drugs to increase insulin levels. But even if none of these criteria applies to you, wouldn’t you want to know right away if your blood sugar is silently rising? By checking your glucose once a day—it takes just three minutes—you could spot a problem before it gets out of control. Record keeping—another essential part of tracking your glucose levels—adds about another five minutes, tops. particularly recommended to obtain information for evaluating potential treatment changes. For instance, you can test before a meal to evaluate your basal glucose; two hours after a meal to evaluate the effect of food; before, during, or after exercise to determine the effect of exercise on glucose; and in the middle of the night if you have concerns about hypoglycemia (low blood sugar). Pregnant women who take insulin or have gestational diabetes should test their blood frequently, too. And there are specific circumstances when monitoring blood sugar is a good idea, such as when your doctor prescribes a new drug or changes a dosage. Monitoring your blood glucose is simple once you’ve assembled your diabetes-management tool kit. You have lots of options, so take some time to learn about their advantages and disadvantages. It’s also a good idea to consult your physician or diabetes-care team for purchasing advice. There are several dozen types of glucose meters available, but most operate on one of two principles. Reﬂectance photometers blast a tiny light beam at the blood sample and measure changes in the light that bounces back. Newer-style devices called electrochemical meters measure electrical current produced by glucose in the blood sample. Both varieties of glucose meters produce a number that indicates the glucose level in your blood. Warning: The following information will only apply to a small number of readers. If you know for a fact that your glucose meter delivers plasma-calibrated or plasma-equivalent readings, you are free to skip this section and go do something else. (Why not check your glucose? You can’t do it too often, after all.) However, if you have your doubts, read on. Home glucose monitors analyze blood in a different way than technicians at labs measure glucose. Home devices assess how much glucose is present in the entire blood sample. Labs, on the other hand, measure the amount of glucose in the blood’s plasma, which is the watery part of blood that’s left over after red blood cells are removed. These two methods of measuring glucose produce slightly different results. Got it? Good, because things get just a little more complicated. Most home glucose meters are plasma-calibrated or plasma-equivalent devices. That means they measure the whole blood sample, but—like a cheap tipper in a restaurant—they automatically add 12 percent to the total. This handy feature translates the reading into a number roughly equivalent to what a lab would produce when measuring plasma glucose. That makes it easier for you to compare your readings at home with the lab tests your doctor has ordered. Almost all meters sold today are plasma-calibrated. However, two models on the market (the One Touch Basic and One Touch Proﬁle) deliver whole-blood readings, meaning they don’t automatically adjust the results to match lab-style tests. (Though if you can recall some middle-school mathematics, you can do so yourself.) Some older meters also produce whole-blood readings. Readings from a whole-blood meter are just as valid as those from a plasma-calibrated meter. However, it’s critical for you and your doctor to know which type of meter you’re using, so bring yours along to your next office visit to find out for sure. Here’s some good news about glucose meters: They usually don’t cost much. In fact, if you ask around, you can probably get one for free. Your health insurance may cover the cost of diabetes supplies. But even if it doesn’t, or you don’t have insurance, pharmacies and clinics often hand out glucose meters at no charge. What kind of crazy, kind-hearted companies give away their products for free, you ask? That’s easy: Companies that want to sell you their test strips, which are an essential part of monitoring glucose. Test strips are not interchangeable—you need to use the kind that are made to ﬁt in your meter, and you’ll go through them by the dozens. Lancet. This thin, disposable needle is the business end of the lancing device. The needle is encased in a cylinder, which you insert into the lancing device. The skinnier the lancet, the less painful the prick. Doctors usually tell patients to dispose of a lancet after one use, but many patients with diabetes ignore that advice and use the same lancet several times. This is not a good idea, however, because you can’t clean it. If you clean the tip with alcohol, you’ll rub off the coating that makes it easier for the lancet to slide into the skin. Using a lancet more than once, then, puts you at risk for infection. Besides, repeated use dulls the lancet, making for a more painful puncture. For obvious reasons, never share a lancet with another person. You may be sharing more than the lancet—an infection, perhaps. Test strips. These strips hold blood samples for a glucose meter to analyze. Test strips are sold in bunches by the vial or in individual foil wrappers. You don’t have a choice, though, about which way to purchase them. Whether you buy strips in vials or individual foil wrappers will depend on the meter you’ve selected, as each meter company determines which way its strips are sold. If you test less often, you may want to purchase a meter that uses foil-wrapped strips, because those packed in vials can spoil over time, especially if exposed to light and moisture. Test strips are coated with a chemical that allows the meter to analyze the glucose level in your blood sample. Unfortunately, the amount of chemical on strips varies from one batch to the next. To account for these small differences, you must recalibrate your meter every time you buy a new box or vial of strips. Don’t worry, your strips will come with instructions for calibrating the meter. Some meters even recalibrate themselves. Recalibrating is usually as easy as changing a code number on your meter or inserting a chip code into your meter. • Wash your hands with soap and water, or rub them clean with alcohol. Be sure to dry your hands well; moisture or traces of alcohol can affect your reading. • Touch the lancing device against your skin—usually the ﬁngertip—and press a button, which releases a spring that injects the lancet. The prick will hurt less if you lance the side of your ﬁngertip, where there are fewer nerve endings. Also, it may help to squeeze the ﬁnger you’re testing ﬁrst to bring blood to the surface before lancing. • Hold your hand down until a bead of blood forms on the ﬁnger. • Dab the blood onto the test strip. • Insert the test strip into the glucose meter and take a reading. 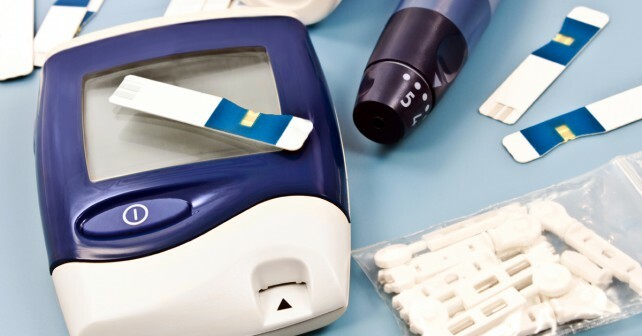 According to one study, nearly two-thirds of people with diabetes say they have skipped glucose testing at one time or another because they don’t like pricking themselves. If playing pincushion with your ﬁngers makes you dread glucose-testing time, then you may want to talk to your doctor about alternative-site testing. Some glucose monitors let you take blood samples from other parts of the body, such as the upper arm, forearm, base of the thumb, or thigh. Beware, however, that these sites may not be appropriate for all patients or circumstances. Fingertips are commonly used for glucose testing not only because they’re—warning, pun alert—handy but because blood sugar changes turn up sooner in the ﬁngers than in other parts of the body. In other words, you may not be getting the latest available news about your glucose status if you’re mining for blood in your legs or arms. • you think your blood sugar is low. • you don’t feel any symptoms but an alternative-site test shows that you’re hypoglycemic. • an alternative-site test produces results that don’t match how you feel. Another alternative for ﬁnger-prick phobes are lancing devices that swap needles for lasers, which use light to poke tiny holes in the skin. The FDA approved at-home laser devices in 1998. But be prepared to dig deep into your pockets with those sensitive ﬁngers of yours, since these high-tech tools cost in the low four ﬁgures. Your glucose meter provides a snapshot of your blood glucose level at any given moment. But your doctor wants to see the big picture: How is your body handling glucose over a period of weeks and months? That’s where your logbook comes in. Think of a logbook as a blood-sugar diary. You use it to record your glucose meter reading every time you test your blood. A page in a typical logbook features a large chart, with columns for breakfast, lunch, dinner, bedtime, and other/snack. The rows list the days of the week, with an “average” row at the bottom. When you ﬁll all the days of the week, use a calculator to ﬁgure out your average glucose level for each period of the day. Some logbooks have space where you can log in other information, such as how many grams of carbohydrates you consumed during a meal (you’ll see why that’s important later on) and how much insulin you took if you’re an insulin user. The chart may also include a column for “comments,” in which you can note any activities (such as exercise) or events (like eating a pound of Godiva chocolates) that may have affected your glucose levels. This information is a gold mine for your physician. A logbook can help determine whether your medication is adequate to keep your blood glucose within a healthy range, suggesting whether you may be taking too much or too little. It also reveals patterns in blood-sugar ﬂuctuations that may offer clues about how you can avoid peaks and valleys. • Is your glucose meter properly calibrated? • Do you know whether your glucose meter measures whole blood or plasma? • Have you recently performed a quality-control check on your glucose meter as recommended by the manufacturer ? • Are you using the right test strips for your glucose meter model? If you’re using “third-party” strips made by other manufacturers, are they appropriate for your meter? • Could some other inﬂuence or substance, such as another medical condition or high doses of vitamins, be interfering with your test results? • Do you live at a high altitude? Has the meter been stored in an unusually cold, hot, or humid place? Climate can affect how glucose meters function. If writing things down on a piece of paper sounds hopelessly low-tech, fear not: Techno-geeks have discovered diabetes. For starters, your physician may ask you to use a speciﬁc type of meter that allows him or her to download your data onto a computer. Then, special software can create charts and graphs that indicate trends in your glucose levels. What’s more, the technologically inclined can use personal computers, personal desk assistants, Web sites, and even their cell phones to record glucose data. The closer you look at glucose meters, the more you may be overwhelmed by bells and whistles; each year brings new models that do more for you. If you are having trouble choosing one, check Diabetes Forecast, the American Diabetes Association’s magazine, which publishes an annual review of glucose meters on its Web site (ﬁnd it at www.diabetes.org). The ADA doesn’t endorse products, but the comprehensive review it publishes allows you to compare the features of different meters. The CGMS System Gold is made up of two parts: a pager-size monitor and a needlelike sensor. The sensor is inserted into a part of the body the manufacturer refers to as “subcutaneous tissue,” which you know better as your belly (though sometimes the sensor is inserted into the hip). The sensor measures glucose levels in the ﬂuid just beneath the skin. Every ﬁve minutes, the CGMS System Gold takes a reading, which it stores in its memory. After three days, when you remove the device, it has taken up to 864 glucose readings. Your doctor downloads the information onto a computer and presto, he or she has a detailed history of your blood sugar levels for the past three days, which may allow for super–ﬁne-tuning of your insulin treatment regimen. Unfortunately, you can’t peek at your glucose readings during board meetings or bus rides, since the CGMS System Gold model on the market in 2005 does not have a readout screen. That also means that you can’t rely on the device to monitor your daily glucose status, so you still have to take your usual blood-sugar readings with a meter. However, a new continuous glucose monitoring system product, called the Guardian RT System (also manufactured by Medtronic MiniMed), was approved by the U.S. Food and Drug Administration in August 2005 and debuted in a controlled market release in seven U.S. cities, including Austin, Texas; Boston, Massachusetts; Chicago, Illinois; Houston, Texas; Minneapolis/St. Paul, Minnesota; San Antonio, Texas; Tampa, Florida; and Salinas, California. The Guardian RT is a patient-owned continuous glucose-monitoring system that displays an updated real-time glucose value every ﬁve minutes and alerts patients when glucose levels become too high or too low. This device gives you access to readings and alarms 24 hours a day, 7 days a week, allowing for better and more precise management of blood glucose levels. Once the company has analyzed feedback from the limited release and ﬁne-tuned its product training and education, the system will become more broadly available. In general, every 1 percent increase in A1c equals a 35 mg/dl rise in glucose. As you know, when you breathe, your lungs take in oxygen. The lungs, in turn, hand over oxygen molecules to red blood cells. Like tiny FedEx trucks, red blood cells deliver oxygen to cells in every tissue in your body, which need the Big O to produce energy. Each of those little couriers has a special compartment for carrying oxygen, a protein called hemoglobin. Glucose molecules love attaching themselves to proteins (a process called glycation), and hemoglobin is no exception. When glucose and hemoglobin hook up, the result is glycated hemoglobin or glycohemoglobin. The more glucose you have in your blood, the more glycated hemoglobin you will have. The A1c test measures glycated hemoglobin. This test is sometimes called a hemoglobin A1c or HbA1c test. There are several different types of glycated hemoglobin; the type named A1c just happens to be the easiest to measure and least likely to be inﬂuenced by what you ate the night before. But why measure this little sugar-protein package at all when it’s easy enough just to measure blood sugar, period? As we have already seen, the blood-sugar testing you do at home offers a snapshot of how well you are controlling glucose at that very moment. The A1c test, meanwhile, is more like a chronicle or history, giving your doctor a look at how well you have been controlling glucose on average in recent months. Neat trick, no? But how the heck does it do that? Red blood cells have a shelf life of about two or three months, so your body is constantly churning out new ones, while others are dying off. At any given time, you have red blood cells on the job that are brand new, others that have been around for a few days or weeks, and still others that are ready to call it quits. Once the hemoglobin in a red blood cell links to a glucose molecule, it stays that way. The A1c test measures young, middle-aged, and old hemoglobin, indicating what percent has been carrying sugar over the last few months. Most experts suggest having an A1c test at least twice a year. It’s also a good idea to have the test before starting on a new medication, then following up in a few months to see how well it’s controlling blood sugar. Don’t toss out your glucose meter and logbook, though. You still need to take daily readings for status updates on your blood sugar. And your logbook not only provides information about daily ﬂuctuations in your glucose levels, but comparing the results of an A1c test with the averages you compile on your own over time can tell you whether or not your glucose meter is providing accurate readings. People who don’t have diabetes usually have about ﬁve percent of hemoglobin that’s glycated. In a person with runaway, out-of-control diabetes, the ﬁgure can rise to more than 20 percent. You want to keep yours as close to normal as possible, of course, in order to avoid the complications that high blood sugar can cause over the long term. The American Diabetes Association recommends an A1c goal of less than seven percent, though your doctor owes you a high-ﬁve if you can keep it even lower. When some critical function goes haywire in your body, the kidneys are often the ﬁrst to know. These organs act like toxic-waste sites, ﬁltering bad stuff from the blood and eliminating it through the urinary tract. If you run low on insulin and can’t use glucose for energy— which, as you know by now, can make you sick—your body has to burn other sources of fuel. This alternative strategy produces high levels of waste products, so the fastest way to ﬁnd out if your insulin has dropped perilously low is to test your urine for metabolic garbage known as ketones. Since ketones float around in the blood before the kidneys filter them, and since people with diabetes become experts at poking their skin with needles, it’s worth asking: Why not just measure ketone levels in the blood at the same time you check blood-sugar levels? A company called Abbott Diabetes Care wondered the same thing and produced a meter called the Precision Xtra, which measures both glucose and ketone levels with just a drop of blood. Whichever method you choose, if a test result shows that your ketone levels are too high, call your doctor right away. Don’t worry: It’s not a taste test, though in the old days physicians often made their assistants sample patients’ urine to see if it was sweet. (Doctors who treated a lot of people with diabetes must have had a heck of a time hanging on to good help.) In fact, while you can tell whether your body isn’t burning blood sugar by measuring glucose in the urine with special kits, the tests aren’t terribly accurate. Instead, your doctor may ask you to test your urine periodically for the presence of ketones, harmful substances that your body produces in the absence of insulin. Remember, when insulin levels drop and your cells can’t get the glucose needed for fuel, they resort to burning fat for energy. Sounds like a swell slimming strategy, but relying on this fallback energy source for too long can be bad news for the body. Burning fat makes ketones, which spill into the blood and urine. When ketone levels rise too high, you can become sick and possibly slip into a coma. • you have type 1 diabetes and your blood sugar rises above 240 mg/dl. • you have any form of diabetes and your blood sugar rises above 300 mg/dl. • you have any form of diabetes and you become seriously ill or are under severe psychological stress. • you are experiencing ketoacidosis for any reason. You can buy ketone strips for urine testing at any pharmacy. Follow label instructions and discuss how to use the test with your doctor or diabetes educator. In general, you will use a clean, dry container to “catch” a small amount of urine (and if you “drop” it, you better clean it up or you risk becoming very unpopular with other members of the household). Then you dip the strip into the urine and wait a few moments. Ketones in your urine will cause a chemical reaction on the test strip, prompting a color change. The degree of color change will indicate your ketone levels when you compare the strip to the chart provided by the manufacturer.